You only have one life to do everything you've ever wanted. Just popping in to give you a quick recipe to get you through the week! I may have gotten a little bit carried away with the Ferrari Engine that is the BlendTec Blender, so my “Salsa” is really more the consistency of Apple Sauce. Either way, it was still delicious and I’ve been eating it for lunch this week. 1. Combine marinade ingredients in a plastic bag (Including steak) and marinate for at least 30 minutes. 2. Add sliced peppers and onion to a pan with coconut oil, cook for about 5 minutes over medium heat. 3. Add steak and marinade and pineapple chunks. 4. Cook for about 5-10 minutes or until steak is done to your liking. 1. Slice pineapple and grill either on normal grill or George Foreman for 8-10 minutes. 2. Combine grilled pineapple, onion and red wine vinegar in blender and blend lightly until desired consistency. 3. Put on top of fajitas and enjoy! 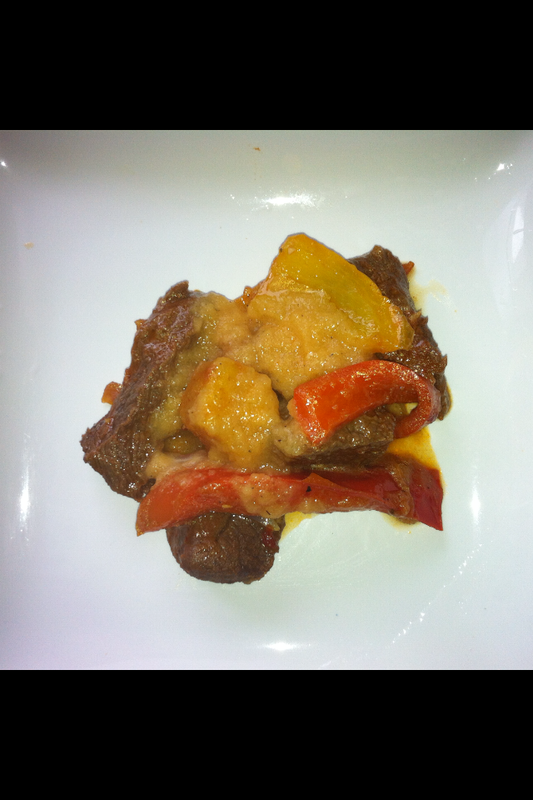 This entry was posted in Paleo, Recipe and tagged CrossFit, diet, Paleo, Recipe by fionaboger. Bookmark the permalink. Thanks girl! We still need to schedule our breakfast/brunch/weekend hike or walk!